Merida is the unicorn everyblittle girl is looking for. 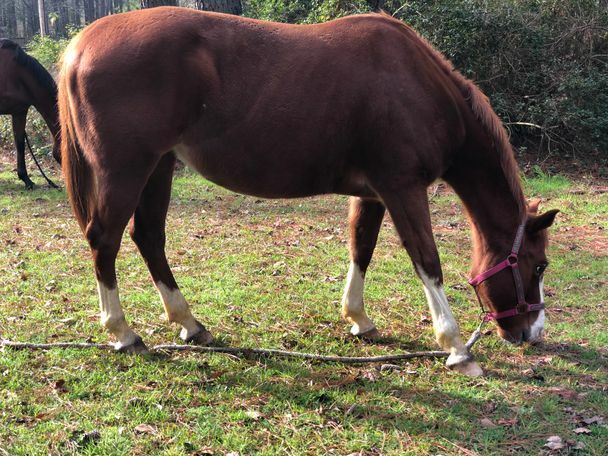 She is an 8 years old, chestnut mare with a blaze and white socks standing at 14.1. Merida is very willing to do anything you ask of her, I currently use her with my special needs and beginner riders however she easily transitions to a more exsperienced rider with ease. She is solid w/t/c with s puppy dog personality. She comes running when called from the pasture and is good by herself or out with a herd. Merida stands for the farrier, vet clipping and bathing. She enjoys jumping but has never been trained to do so according to my previous knowledge of her. She goes in both western and English. Please contact us to mee Merida today!